Getting around in Kraków is pretty easy. Kraków has a fairly dense public transport system which consists of tramways and bus lines. One-way ticket for a municipal bus or a streetcar (tram) is 3.8 złoty (an equivalent of roughly 0.9 Euro). You can buy it at newsstands and from ticket machines at downtown stops and in some buses and tram cars. If there is a ticket machine in bus or tram it is located at the front part of the bus or in the first cart of the tram. Drivers sell 60-minute tickets worth five złoty. Immediately after boarding you should put the ticket through the ticket puncher and keep it till you reach your destination. A 20-minutes ticket allowing for changing lines costs 2.8 złoty (PLN), its 40-minutes equivalent is 3.8 złoty (in fact it is the same one as a one-way ticket, you can use at either as a one-way ticket with no time limit or as a 40-minute ticket while changing lanes), an hourly one 5 złoty, and 90-minute ticket has been priced at 6 złoty. The prices of unlimited-travel passes for all municipal buses and streetcars have been set at 15 złoty for a 24-hour ticket, at 24 złoty for a 48-hour one, and at 36 złoty for a 72-hour pass, while a seven-day unlimited-travel ticket costs 48 złoty. Tickets are valid for the stated period starting with their first punching on a bus or a tram (don't punch your ticket any more till its expiration). Kraków’s streets are packed with vendors selling obwarzanki – round, twisted baked bread rolls, which have become a culinary symbol of this mediaeval city. In the region of Kraków you’ll find some of Europe’s tastiest apples, delicious cheeses from the mountains and unrivalled cured meats. Kraków is Poland’s culinary capital – no other city can boast an accumulation of so many restaurants in a relatively small area. This goes hand in hand with quality as confirmed by the prestigious Michelin Red Guide. Its authors recommend 36 restaurants throughout Poland, including 17 in Kraków. Kraków is proud of its merchant traditions standing at the crossroads of important trading routes, it has been attracting fans of spices and fabrics, artworks and local crafts. Today locals and tourists buy souvenirs, books and everyday objects in Kraków’s shops, malls and bookshops. Many search for clothes, jewellery, cosmetics – both famous and local brands. Good Polish brands – Hera, Hexeline, Deni Cler for women, Vistula for men, Apart, Batycki and W.Kruk – jewellery and accessories, Gino Rossi and Kazar - shoes. Food stores are generally open between 6:00 or 7:00 (6:00 a.m. or 7:00 a.m.) and 18:00 (6:00 p.m.). Other shops tend to be open between 10:00 or 11.00 (10:00 a.m. or 11:00 a.m.) and 18:00 (6:00 p.m.) from Monday to Saturday. Many shops are also open on Sunday. The chain and shopping malls are open long hours, usually from 8:00 (8:00 a.m.) to 22:00 (10:00 p.m.) or later on weekends. Poland is fast becoming a shopper's paradise. The most popular souvenir is amber from the Baltic sea. Poland is also known for its silver jewelry. Small family-owned galleries sell various products of handmade crafts and pottery. Regular banking hours are 9:00 (9:00 a.m.) to 18:00 (6:00 p.m.) from Monday to Friday. Banks, shops, restaurants and other public institutions stay open at lunchtime. The official Polish unit of currency is Złoty (PLN). Major convertible foreign currencies may be changed into Polish złoty at banks, hotels and at private currency-exchange offices (in Polish "kantor"). In general, traveler's checks can be cashed and all major credit cards are accepted. The current exchange rate can be found here. There are many ATM machines located in vicinity of banks. They accept MasterCard and Visa cards. Poland lies in the zone of moderate climate, intermediate between the marine and continental climates and the weather can be rather changeable. For current information, see Forecast. There is usually a good warm weather in Poland in July. The temperature can be very nice, ranging from 20 till 30 °C. 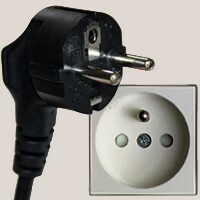 Poland's power grid supplies 230 V/50 Hz current; round, European-style, two pin plugs are used. The population of Poland is 38 million. Over 1.8 million live in Warsaw - the capital of Poland. Polish is the official language. English and German are among the better-known foreign languages. The population is largely of Polish descent and more than 90% profess to be Roman Catholics.